Our product range includes a wide range of sodium chlorite powder, sodium chlorite -80% powder, sodium chlorite 31% liquid and sodium chlorite - 80% powder. Solid sodium chlorite is white crystalline substance, stable in room tempeture and normal storage conditions. Sodium chlorite on reaction with acid release chlorine dioxide gas. Packed in iron drum with plastic bags , net weight 50kg/drum . The main application of sodium chlorite is the generation ofchlorine dioxidefor bleaching and stripping of textiles, pulp, and paper. It is also used for disinfection of municipal water treatment plants after conversion to chlorine dioxide. [An advantage in this application, as compared to the more commonly used chlorine, is thattrihalomethanes(such aschloroform) are not produced from organic contaminants.Chlorine dioxidegenerated from sodium chlorite is approved byFDAunder some conditions for disinfecting water used to wash fruits, vegetables, and poultry. Packaging Details: PACKED IN 50 KG IRON DRUMS. Packaging Size 50 kg metal drums. Packaging Type 50 Kg Metal drums. Usage For chlorine dioxide generation. UsesSodium Chlorite Solid used in producing chlorine dioxide, or bleaching textiles, fiber, paper pulp, sand sugar, flour, wax, fruit etc, or certain metal surface treating, drink water and waste water purification etc. Package and symbolSolid net weight 50kgs iron drum with plastic liner, or following customer's demand. StorageDo not mix with acid or reducing substances, Sealed tightly and store in cool and dry place. Avoid sunshine and keep far away from heat and fire. Fire Extinguish it with sand, water, or other kinds of fire extinguisher.Storage areas should be equipped with suitable material to catch spill, storage should be locked. Sodium chlorite - 31% Packed from a ISO 9001:2015 certified manufacturer. Available in follwoing packings. - 35 Litre jerry can. 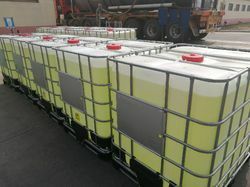 - 1.25 Mton IBC tanks. 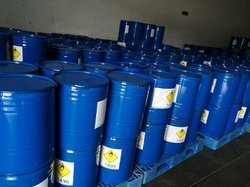 The main application of sodium chlorite is the generation ofchlorine dioxidefor bleaching and stripping of textiles, pulp, and paper. It is also used for disinfection of municipal water treatment plants after conversion to chlorine dioxide. [An advantage in this application, as compared to the more commonly used chlorine, is thattrihalomethanes(such aschloroform) are not produced from organic contaminants.25,33Chlorine dioxidegenerated from sodium chlorite is approved byFDAunder some conditions for disinfecting water used to wash fruits, vegetables, and poultry.